I made a few of these some years back and planned on making a bunch more to cover the top of our entertainment center. Here's how. 1. First you're going to break out that green paint and cover the base and tip of your styrofoam cone. This is because you are more likely to have some bare spots that show through at these two parts of the tree and we don't want them to be white and stick out. 2. Now we are going to start glueing your feathers on. I'm totally crazy and ordered my feathers online because I knew I was going to do alot of trees and therefore needed alot of green feathers. You don't have to do green of course. White, red or gold would look fantastic too. Just pick up your feathers at the craft store or you can even take apart an old feather boa. Start by glueing a round of feathers to the very base of your cone overlapping them all the way around. Notice that these feathers are flush with the styrofoam and not curving away from it. 3. Next you're going to go back over your first layer of feathers with another but these will curve away from the base. I try to find curved feathers for this step but if you're a little short on those you can always crimp your feathers with your nail to bend them the way you need. Now start glueing these feathers all the way around, not overlapping each other. 4. Continue to glue feathers on moving your way up to the top of the cone. Make sure to offset the feathers as you adhere them so your "branches" are staggered like below. 5. Take your tree outside and spray it all over with as much glitter as you want for a sparkling finish. I used green glitter but you can use white or other colors for a more dramatic effect. 6. Now you're going to want to cut a piece of your log to use as the base/trunk of your tree. Luckily I got this from our backyard but if you're short on tree limbs check your local park or even a friend's firewood pile. I suggest about a 2 inch chunk but you can try out different heights under your feather tree. Adhere this to your cone's base to form the trunk of your tree. A quick note on where you get your wood base: I like to take the bark off and for a couple reasons. One being its easier to keep clean and two is that I like the smooth look. My log came with a couple extra details too. but as I worked on a couple other pieces I ended up finding 2 that were still alive. This is why everyone always says to not move firewood because you never know what's inside. (And for my work friends, no I didn't take them to work for ID.) Ok back to craftin. 7. Last but not least take your star and insert the wire end into the top of your foam cone through the feathers. I found these in the wreath/fake flower section of my local Joanne and you can see that they have a few different colors. Tada! You're done. Here's some shots of the finished product featuring two of my best models. I like making them in different sizes, it looks like a mini Christmas forest. VERY COOL! Fantastic project! Thanks for sharing. These are awesome!! Love how they look on your entertainment unit. This is a very nice tutorial! I love the feather trees, but they are so expensive! Great, great craft! Stopping by from Vintage Wanna Bee blog hop. I love your feather tree, very pretty. I have an ongoing Winter linky you are welcome to share it in or at my anything goes linkky fri-monday. Happy holidays. That is a great idea and you are doing a super job on yours. I am not into that type thing anymore, but love seeing what others create. 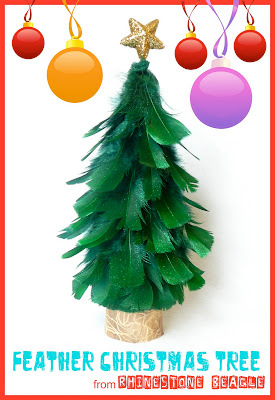 I love the feather christmas tree! I thought of making something similar to this last year, but it just wasn't working out in my head or in real life. LOVE your tree. These look great! I love that you made a forest of them, its a statement piece. I just found your blog and Im a new follower! Maybe you'll follow me back? These are so cute! I love all the different sizes, very woodsy christmas cabin feel. I'd love to invite you to share this project at my Thingamajig Thursday party going on now. Found you from Someday Crafts. LOVE these trees! I love how you made a bunch in all different sizes! Great display! thanks so much for the inspiration!! Have a happy weekend! These are so cute! I love the simple look with just one topper. You're dogs are amazing models, very adorable. New follower from Passionately Artistic. The feather tree is Adorable! Thank you so much for linking up to Upcycled Awesome and Everything Else! This is so fun & whimsical - I love it!! I am so anxious to try this. Thanks for sharing it on Motivated Monday. I am featuring it tonight on my BeColorful post. Ah, how cool! I love how you made a bunch, they look really great grouped together like that! P.S. I'm featuring your post on my Facebook page today. Love your forest of Christmas trees...so fabulous!